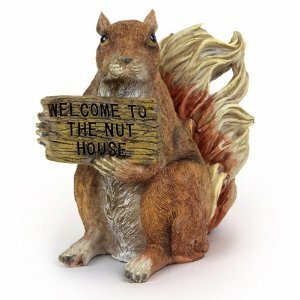 A South Carolina woman was arrested Wednesday for stabbing her common-law husband in the chest with a ceramic squirrel. His offense? Returning home without beer on Christmas Eve. Helen Ann Williams, 44, of Charleston, S.C., has been charged with criminal domestic violence of a high and aggravated nature after police responded to a 911 call from the victim. She’s also being charged—in the court of public opinion—for decorating her home with ceramic rodents. According to the police report, Williams’ husband was unable to purchase beer early Wednesday morning because stores were closed after midnight. After returning home and informing her of this fact, he began making himself a sandwich. Enraged by the lack of beer on Christmas Eve or perhaps her husband’s sandwich-making in the face of disaster, Williams picked up a ceramic squirrel, hit him in the head, and then stabbed him in the chest. Officers first arrived at the scene and noticed scratches on the man’s face and a “large amount of blood smeared across his upper body and down his arms.” When they took off his shirt, police also noticed a large gash in the man’s chest. Rather than admit her role in the squirrel attack, Williams initially told police her husband must have fallen.